Fabric Creations has been supplying the retail trade drapery and soft furnishings for two generations. Our B2B focus provides flexible manufacturing specifications that will enable you to select the quality that is applicable for “Your Market”. You know your customers end use and their requirements for either high end show homes, retirement villages, hotels, or the discerning homeowner. Fabric Creations provides the level of quality expected at every point on the markets compass. Whether it be cushions, drapes, curtains or tie backs for matching blinds, you set the standard and we provide the finished goods - on time. Architects, builders, engineers and interior designers all expect projects to be delivered to the client on time and in budget. At the sharp end of a build, whether the project is a one bedroom apartment or a multi- use tower block, the pressure on everyone to deliver is immense. As manufacturers and suppliers of premium custom curtains, drapes, blinds and soft furnishings, we understand that timelines need to be met, whether they'rerealistic or not, and at the expected cost. Our reputation for delivery in NZ is in our DNA and our cultural backgrounds. At every step of our process, quality is assured to our customers. “Fineness is found in our detail, quality established by hand and machine”. So let’s talk your timelines and client’s expectations. We aim to solve problems when others are discouraged. Triple interlining, 4 or 5 meter drops, heavy weights, difficult fabric and shape to pattern match, or the sheer size of a project are all challenges we relish. It could be an overseas Premier secretly arriving with only a few days’ notice or a hotel lobby that needs urgent attention. When others won’t commit the effort to deliver, we have the passion to meet your needs. “Proven Quality, Proven Results and Proven Delivery”...each and every time. Our curtains, drapery and soft furnishings manufacturing business is now in its second generation It is run by the son and daughter in law of its founder Eileen. Her skills were honed in the UK over 50 years ago, working with illustrious customers from the Arab States, the USA, France and the London high end retail giants such as Harrods and the John Lewis Group. Eileen gained their respect and 25 years ago she brought her knowledge to New Zealand which she has passed on to the team today. In 2012 Christine took over the running of the operation. She was newly married to Eileen’s son Steve. 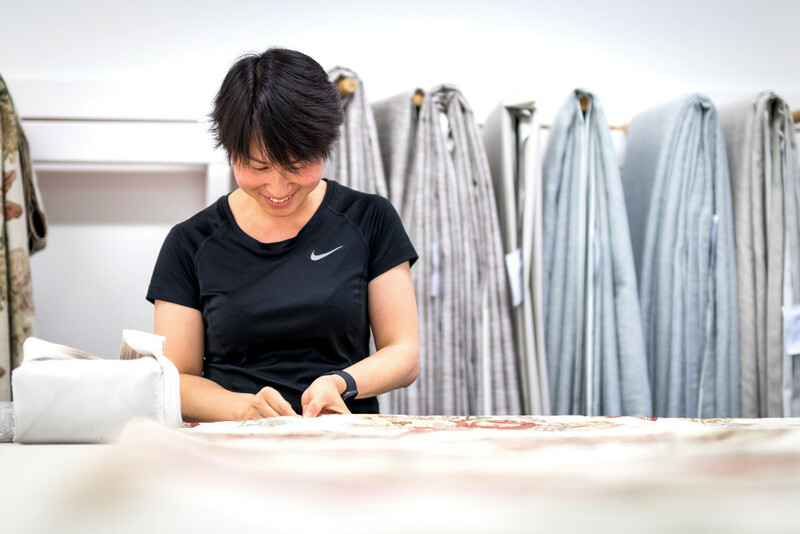 The once ‘Hong Kong stock broker’ has honed her skills, trained her team and has provided drapery and soft furnishings for some of the most challenging and aspirational projects in New Zealand. To achieve an interior designers’, architects or homeowners’ vision is paramount. The visual pleasure provided by soft furnishings can be destroyed by lack of attention to detail. Pattern misalignment, lineal and dimensional inaccuracies all result in the disruption of a clients’ visual pleasure and therefor their ability to relax in their new space. Accurate pattern matching, pleat pattern placement with lineal accuracy is key. The Fabric Creations team understand the importance of vertical and horizontal alignment so pleats are formed with the utmost care to ensure the perfect drape. Fabric does not come in exact dimensions despite the mills best endeavours. Automated manufacture lacks the finesse of the human eye when assembling and spacing pleats. Hand finishing with care cannot be replicated to a bespoke level by a machine. No single person makes a drape, cushion or duvet cover or other soft furnishings. Good cutters, fabric joiners, pleat sewers and finishers all make a perfect end product. To be consistent in quality, whilst maintaining a process that ensures a competitively priced product, requires a team of individuals working at a happy pace. 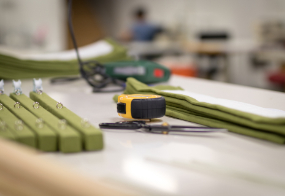 The Fabric Creations team have a routine that ensures perfect results. In turn the team are supported by suppliers and service providers who are all highly dependable and are part of the crew. When training new staff, Fabric Creations' mantra is Quality First. Speed will follow, and although it is essential to our competitive edge and maintaining our place in the market, we will never sacrifice the quality. We now process in excess of 4,000 meters per month, much of which is in delicate designer fabrics that need to be handled with extra love and attention during their journey.We don’t just talk quality…….our customers do that for us. The emails and texts we receive thanking our team for a job well done, show us that we are practicing our mantra of “Quality First”. So don't hesitate to make contact with us today. Fill out the form below and we will get back to you today or feel free to pick up the phone and give us a call. 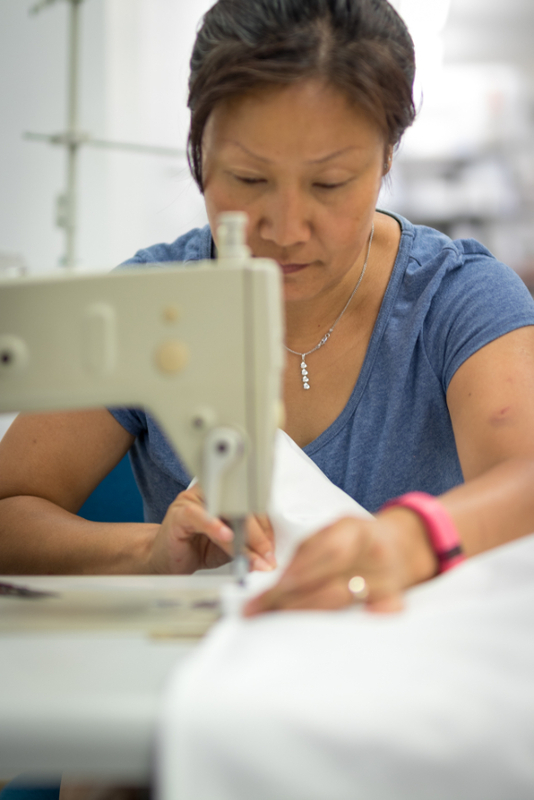 Centrally located in Tauranga, Fabric Creations' modern facilities are located on the edge of transport network and logistics hubs that service all of NZ from the busiest port. We look forward to discussing your curtains, drapes, blinds or soft furnishing project.